I am typically reluctant to take on projects that involve working sessions with large boards. Boards by their very nature are not fertile environments for innovation or, more importantly, critical specialization. As with all generalizations, there are exceptions – but the typical large board is a disparate group of people who escape their full-time jobs for a couple of hours a month or quarter to lend brainpower to an effort. Group dynamics drive the effectiveness of the board as much as the experience and expertise of its members. The looseness of the bonds between board members does not provide the requisite foundation of comfort and trust to take the measured risk that excellence requires. Typically, the most vocal individuals speak up with the most apparent ideas. From this base, some honing ideas are integrated and it’s job done. Once the group has started down the ‘most apparent path,’ it’s very rare to pivot to a place where an innovative, or even specific, vision has a chance. It can be done, but group dynamics are an opposing force. This is especially true of new boards for new efforts – like the EDC. Just producing solid professional output feels like a victory. It is from this perspective that my appreciation goes to the EDC leadership team – J.P. DuBuque, Mike Vivio & Chris Steinocher – for understanding that to reveal our true St. Pete to the businesses that belong here, we couldn’t take the most apparent path in our positioning efforts. Their strong leadership was an environment in which a specific vision, like ours, could flourish. Economic Development websites around the country are largely the same words and pictures with a different city name at the top. The ‘board effect’ is likely in play for many of them, and it is amplified by a reluctance to shut out any potential businesses by constricting the generality of the content. This is a mistake that many businesses make and EDCs are no exception. It’s counter intuitive to think that narrowing the range of people you speak to increases your chance of success, but it has never been more true. St. Pete is truly wonderful for some very specific reasons. If a company aligns with those reasons, we’ll leverage our natural competitive advantage to win them and we’ll attract the business citizens that will plug in and elevate those same wonderful qualities. The right companies deserve St. Pete and St. Pete deserves the right companies. The reality is that St. Pete doesn’t stack up well on many of the traditional metrics anyway. We don’t have the land or the mass transit to support large corporate campuses or industrial parks. Our strategic guide, the Grow Smarter initiative, put forth 5 key industry clusters to pursue: Marine & Life Sciences, Specialized Manufacturing, Financial Services, Data Analytics and Creative Arts & Design. In positioning St. Pete, we added a 6th cluster – a horizontal one that striped across our 5 target industries – focused on the types of leaders that are most likely to share our vision. Leaders in our 6th cluster understand the changing face of corporate America. No longer do companies compete with other companies for talent – now the most alluring option for skilled individuals is no company at all. The entrepreneurial option has never been more accessible than it is today. Nearly every function in a company can be sourced through contractors. Going this route is appealing for many businesses and for many individuals and thus the infrastructure of work is evolving to engender this new normal. For businesses that want full time employees, or close proximity contractors, they must build a ‘whole life’ work environment that competes with the quality of life benefits that choosing ‘no company’ offers. By simply existing in the special, fulfilling space that St. Pete is, a company can fill a good portion of the quality of life bucket for talent. By activating the St. Pete mindset, a company’s culture can weave work and community together to create the lifestyle that Millennials crave. This balance leverages the power of the group (company) to drive a life that offers more to the individual (contractor) than the individual can achieve on their own. St. Pete is already positioned. Our job was to craft the words and images that reveal the stuff between the stats. For images, our theme is unpolished humanity. St. Pete citizens are deeply passionate about their city. 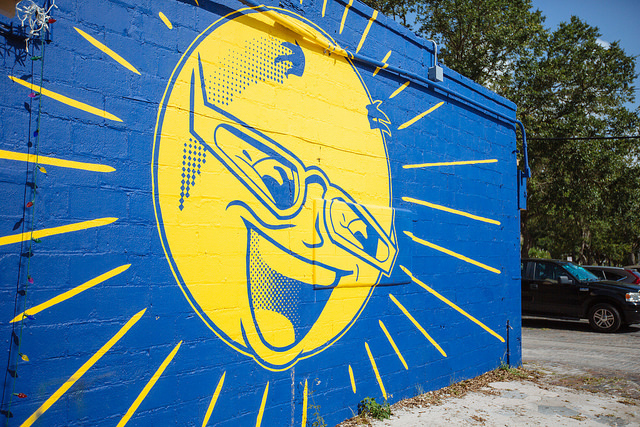 We chose images that give glimpses of the daily joy in St Pete, without overtly ‘shouting’ it or leaning on the overused amenities of Florida living. Time: The renaissance is just beginning. Think early Austin or even earlier San Francisco. For companies with vision, getting in now offers additional value because of what we are becoming. Opportunity: Akin to the land rushes that provided brave settlers great rewards – opportunity here is as ample as the land in an unsettled west. The right companies will see and seize the corporate and personal opportunities here for an extraordinary quality of life. Impact: St. Pete still has a great deal of unclaimed intellectual real estate. There are few gentrified, loud voices drowning out the people. If you have a spark, the community will catch fire around it. Individuals or businesses can shape the landscape of the entire city. Purpose: St. Pete residents are in love with their city. Inclusivity, acceptance and support enthusiastically drive purposeful living. There is a sense that the whole is greater than the individual and thus we’ve eschewed much of the divisiveness that hardens other communities. The design is humble. Yes – it’s simple, but many sites are simple. We wanted the website to convey vulnerability with an underlying confidence. Vulnerability lowers the guard of the visitor and allows them to form their very important first impression with an offensive mindset instead of a defensive one. The offensive mindset means they are imposing their value system on St. Pete to determine fit instead of defensively filtering sales copy. This is a subtle but critical perspective shift because it happens first and can drastically change the first impression. I don’t believe the magnitude of the right first impression can be overstated in today’s deluge of fragmented information. The purity of the homepage is the breath of fresh St. Petersburg air we want our visitor inhaling before they do anything else. Positioning St. Pete was an honor and a great team effort. The forward thinking of the EDC leadership set the environment for a unique vision and our talented board is activating the brand. My brilliant Big Sea team delivered the words, images and design that reflect the awesome qualities of this place we love. I encourage you to get involved with and support the EDC so we can grow smarter, together.